True sages are members of the Salvia genus and number in the hundreds. They are native to a wide variety of environments worldwide, which is why some are ideal for the dry gardens of California and others can handle the abundant moisture of the American Southeast. Flowers by the Sea raises many sages that grow well in the Southeast, including some that are either native to the region or have jumped fences from gardens into the wild. 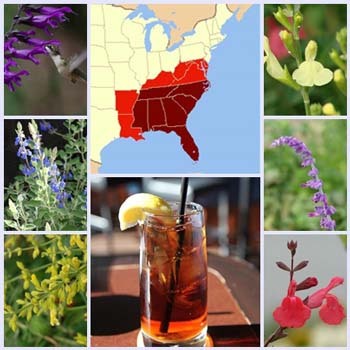 Getting Started is a series of articles intended to help gardeners new to the Salvia genus. Success in cultivating sages is partly based on selecting types that are appropriate for regional growing conditions. Maps of the Southeast sometimes define the region as containing far more states than we cover here. This article is limited to the southern states with an Atlantic seaboard -- Virginia, North Carolina, South Carolina, Georgia and Florida. To grasp the broad range of abilities in the Salvia genus, we need to compare two extremes of precipitation. California is so long and has so much climatic variety that it might as well be its own region. According to the National Oceanic and Atmospheric Administration, in 2013, California averaged about 8 inches of precipitation -- rain and snow combined. NOAA adds that the state's historical average is about 23 inches a year. Compare California's 2013 figure to one that the Southeast Regional Climate Center cites for the Southern Atlantic states plus Alabama. They received an average of nearly 61 inches of rain. The Climate Center says that amount was about 10 inches more than the Southeast's historical average of about 50 inches. It notes that the National Drought Monitor recorded the region as experiencing "abnormally dry" conditions -- the Monitor's lowest drought ranking -- from 2010 to 2012. Drought is a relative term based on historical averages and shortages over an extended period of time. In the Southeast, abnormally dry would mean something less than 50 inches a year; in California, the benchmark is less than half that number. So extreme dryness isn't a Southeastern problem, at least at present. What many Southeastern gardeners do have to contend with is persistently damp soils created by a rising water table. Ironically, waterlogged soils along the Southeast coast are caused, in part, by groundwater depletion -- a problem of increasing population. Land sinks when use of groundwater exceeds its replacement by rain. Combine this geological phenomenon with increasing sea levels due to glacial melting at the poles, and you get salty tidal waters rushing into sinking shores to create the hydric (saturated) soils of marshes, bogs and soggy home landscapes. Most Salvias need good drainage so oxygen can reach plant roots. However, some species can handle damp roots. One example is Bog Sage (Salvia uliginosa), a choice for Zone 6 to 10 that also grows well in dry conditions. Another is Anise-Scented Sage (S. guaranitica), which is popular throughout the Southeast partly because it adapts to damp conditions. Damp soils are one reason why raised bed gardening is common in the Southeast. For example, Norfolk Botanical offers classes on the topic. Raised beds with well-aerated, loamy soil are ideal for Salvias as long as lengthy rainfall doesn't overwhelm their ability to drain. Container gardening is another good idea for controlling soil quality. North Carolina Salvia specialist and retired chemist Dr. Richard Dufresne notes that if your lawn continues feeling soggy hours after a big rain ends, the saturation is a good indicator of a high water table. In that case, he says, construct your raised bed so its soil is completely above ground. This likely will mean building a bed significantly taller than 8 inches. To keep silty hydric soils from percolating upward, he suggests placing a 2-inch layer of large gravel at the base of the bed and venting this area to the outside of the planter box so the gravel doesn't compact. Then line the box with permeable landscape fabric before adding loam. One way to search the FBTS online catalog for water-loving sages is to click on the Salvias by Culture link in the catalog menu bar atop our homepage. Then click on the subcategory "Moisture Loving." Subtropical species such as Roseleaf Sage (Salvia involucrata 'Bethelli') Zones 8-10. All of these sages grow well as annuals in areas where winter weather is chillier than the zones in which they succeed as annuals. But what are zones? The USDA Plant Hardiness Map divides the nation into 13 zones based on historical data concerning average winter minimum temperatures. Each zone is further divided into two subzones (a and b) in 5-degree increments. The lower your zone number, the colder your winter temperatures. Each zone is separated by a ten-degree increment. Overall, the Southeast has one of the broadest ranges of USDA zones, because it stretches from Zone 5a on the western edge of Virginia to Zone 11a at the tip of Florida. So, depending on where you live, the historical average of winter low temperatures may range from -20 to 40 degrees F. In general, FBTS doesn't estimate plant hardiness by subzone in plant descriptions. We find 10-degree zone increments sufficient for rating the hardiness of the highly adaptable Salvia genus. Also, microclimates in your neighborhood or parts of your backyard -- such as the warming waters of a nearby creek or beneficial placement of a plant near a warm brick wall -- often have a more profound impact on survival than a temperature difference of 5 degrees. Similar to New England, the entire East Coast is dominated by acidic soils. Exceptions include soil near beaches where the calcium carbonate in crushed seashells tips the balance toward alkalinity. Acidity and alkalinity refer to pH, or the chemistry of soil, which is rated on a scale in which 7 is neutral (perfectly balanced). Lower numbers are acidic whereas higher numbers indicate alkaline soil -- the kind most semi-arid sages prefer. 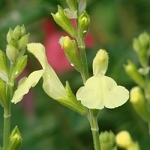 We can't recommend desert sages for the Southeast, but many other Salvias are adaptable to a wide range of soils or are woodland plants -- such as our Japanese species -- that are naturally inclined to acidity. However, getting your soil tested through a local agricultural extension office or independent lab is a wise choice, because conditions may vary from one state, neighborhood or yard to another. Elk Lemon Light Jame Sage (Salvia x Elk 'Lemon Light') Zones 6-9, a hybrid developed by FBTS. The USDA further indicates the following sages as being introductions that have naturalized in the wild. All have a long history of use in folk remedies. Wild Sage (Salvia verbenaca or S. verbenacea) Zones 5-9. It seems fitting to end this article at the tip of the Southeast -- Florida -- and on top of an imaginary green roof with environmental lawyer Kevin Songer. Writing at Native Plants and Wildlife Gardens, Songer talks about Lyreleaf Sage forming what he calls "endless miles of stunning lavender hues" along Florida's highways. Songer loves Lyreleaf so much that he plants it on green roofs he designs. He adds that it is an "underutilized rugged, illustrious grace." Many lovely species of Salvias are tough and easy to grow yet underutilized. Select such a plant and grace may take root in your yard. If you have questions about any of the species mentioned here or in our catalog, please grace us with a call or email for more information.